Applications in one DVD *Updated* 11th of October 2012 Deluxe DVD9 Edition - Marlboro » Твой Варезник! Твой интернет! It took me more than a month (actually one month and 11 days) to collect this impressive DVD Size packet of applications , sort what is good and what is bad , scan it for your protection with 42 Known antiviruses , make the .iso image so you can easily burn it onto a DVD (at 4x Recommended speed) , adapt it so it can fit in exactly one single DVD/DVD9. The main question is why all this? Well . Just because I know how frustrating is after installing a new operating system to look for apps in different CD's DVD's etc or Surf the net countless hours in finding the right , working application that suits your needs . I have organized this DVD (8,5 GB) in such a way that is very user friendly. In the Root Folder [right after you open the image] you will find the main base folders that will contain all other (specific) data . Every folder has it's own type of applications . For instance in "Audio Utilities" you will find only audio related applications for example : "Winamp"
Mainly because it's well organized , safe to use and easy to operate with . 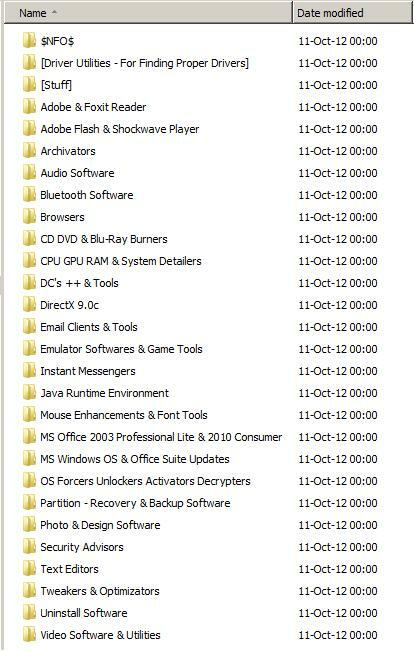 It contains the direct app's, this means they are not in archives so you will need to do extra work when installing one product , the installation executables are waiting for you to open them right in the respecive folder of the respected (named) application. Another Reason would be the 'updates' , in a larger sense , the new applications , they are always recommended because they have solved earlier builts bugs and newer apps are always more stable than older ones . Of course new is not always better but I have carefully selected for you the best of the best applications so you can enjoy a full multimedia experience and not just install bloatware (unneeded software) . What does the DVD Contain ? It does contain all necessary software for a PC to run more than smoothly and safe . All Applications have been pre-cracked or have a special folder near them called 'cure' 'fix' , 'SN (txt)' , 'crack' , 'patch' or "How to" (txt). You will also need NET Framework for some applications , so here it is , the latest version (some of them use this so you better have it - it also improves the system stability once installed).